"The world’s biggest NGO for animal rights wanted to change its communication: From in-your-face to face-to-face. Therefore, PETA initiated the first real dialogue between an animal and humans. We set up a one-of-a-kind application that combined virtual reality and live acting. 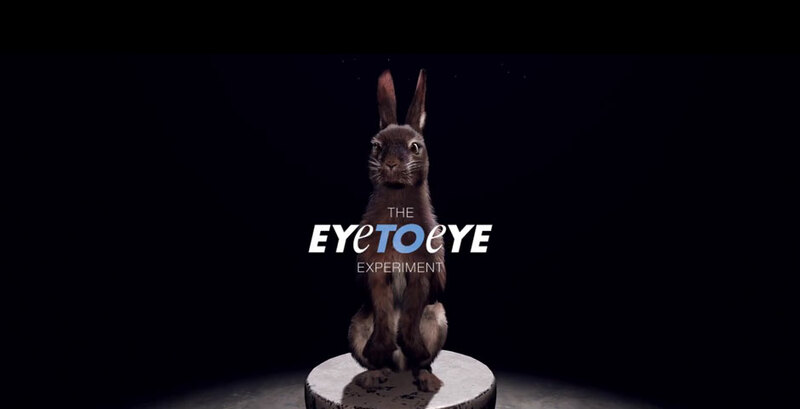 At numerous events throughout Germany and the US, a rabbit, the signature animal of PETA, welcomed people to a virtual world with an eye-to-eye dialogue. The element of surprise was on our side because users don’t expect a virtual creature to be as intelligent and empathetic as the rabbit was. The secret: a psychologically trained PETA activist controlled the rabbit live through advanced, real-time tracking technology." "It is a psychological fact that empathy grows through personal dialogue. Numerous experiments have proven this, from antagonised political beliefs to the refugee crisis. If you understand your opponent, you open up to them and are more willing to take their point of view and change yours. Based on this insight, there was one question that inspired us: What if an animal could exchange thoughts with mankind? What if it asks us inconvenient questions and makes us realise how deeply related animals and humans actually are? What would you say when the animal wants to know why you kill and eat it?" "The idea was to engage people in a 3- to 5-minute chat with an animal. To our surprise, the average dialogue ended up lasting 12 minutes. People completely forgot that they were talking to a virtual creature. Their reactions were much more emotional than we dared to hope for. They opened up and talked about their beliefs, personal loss, fears and hopes. And they listened. Most of them described their experience as touching and started to rethink their consumer behaviour. Some even became activists themselves. With 3 million views, the clip of the experiment too exceeded our expectations. Moreover, a lot of media buzz helped to spread the rabbit’s message even further." "One crucial moment occurred very early on in the process as we realised that brutal images of tortured animals and an accusing tone of voice repel people, instead of making them stop and think. This was the shift in PETA’s communication strategy from in-your-face to face-to-face that ignited the creative process and finally led to the Eye to Eye experience. Later on, as we pre-tested the live dialogue format with real users who didn’t know what to expect, we realised how powerful the combination of VR and live acting actually is when it comes to touching people emotionally. This was the breakthrough moment that left no doubt that we had something really exciting here." "By combining virtual reality and live acting for the first time, we created a highly immersive experience that surprised users with real emotions. In a virtual environment, users implicitly expect to encounter artificial intelligence. Hence, the implementation of an empathetic PETA activist, who controlled the rabbit through advanced face and body tracking technology, was key for achieving such an impact. Without this innovative combination, the eye-level dialogue between human and animal wouldn’t have been possible. Moreover, VR opened the door to a new target group for PETA: tech aficionados and influential geeks who hadn’t thought about animal rights until now." "Since the combination of VR and live acting had never been done before, we came across a lot of technical and conceptual challenges. The greatest challenge was to deal with the unforeseeable, as nothing was scripted. That’s why we put a lot of effort into the preparation of the PETA activist. In addition to psychological training, he was equipped with various virtual environments (slaughterhouses, forests, etc.) and a massive amount of facts that he could refer to during the natural flowing conversation. Not only did we create one intense dialogue, but also hundreds of individual ones. So, seeing that the experience actually works and touches people emotionally was the most rewarding moment." "It was shocking to study the worldwide practice of animal exploitation with billions of victims every year, and fascinating to see how much humans and animals actually have in common. What struck us were the irrational beliefs that underlie our relationship with animals and how we can uncover them with a simple eye-level conversation. Something else we took from this project was how persuasive VR is when it comes to involving and motivating people. As we brought real emotions into a high-tech medium, we discovered that VR is not only about storytelling, but interactive stories are what give virtual worlds such great potential to inspire people and make a difference in the real world." People completely forgot that they were talking to a virtual creature. Their reactions were much more emotional than we dared to hope for.